Remember Happy Fun Ball from Saturday Night Live’s greatest commercials? Today we purchased the Happy Fun Ball, or as the “As Seen on TV” people are now calling it, The Wubble Bubble Ball. It’s a similarly dangerous ball, made from some form of plastic not fully definable by NASA. We discovered that for a measly $19.99…you can buy one for your child and expose them to the highs and lows of human emotions…in a matter of minutes. Yay! In my morning pre-coffee haze, I made the rookie mistake of asking what the Wubble Bubble Ball was again. I was reminded, in great detail, of how it was a life changing, part bubble, part ball, nirvana-producing toy. Being the complete schmuck I am, I made getting the Wubble Bubble Ball my top priority today. When it was purchased, I have never seen my daughter so happy. Literally. Her only regret was that she didn’t have to get into fistfight for it in the store. She glowed from her purchase with her babysitting money. Parent of the year, people. Well, the Wubble Bubble giveth…and the Wubble Bubble taketh away. Back at home, trying to pump it up, Lily accidentally put a whole in it. Never even got a bit of air in the cheap piece of crap. Now you might be thinking that she’s 12 years old and she will react to this calmly. You would be dead wrong, and completely unknowledgeable about 12 year olds. She cried. There were real tears that bordered on hyperventilation. There was desperate talk about how nothing, nothing, ever goes right for her. I tried to comfort her. I tried to tell her how funny it would be later. She was having none of it. Finally, I walked away and left her wailing about the goddamn Wubble Bubble Ball. Once she lost her audience for the dramatics, she quickly realized crying alone was no fun. I highly recommend this as an advanced tactical strategy for ninja parenting. Well, not to be defeated by the Wubble Bubble Ball, we packed up the defective one, returned it to Target and bought a new one…because…we are incredibly, horribly stupid. This time, Lily enlisted the help of her dad to blow up the Wubble Bubble Ball. I informed them that if anyone cried about the Wubble Bubble Ball I was checking into a hotel for the night. Dan, sweating and frustrated as he was unable to follow the instructions consisting only of vaguely sketched cartoons, said he might be the one who cries. Low and behold, to all of our surprise and wonder, the Wubble Bubble Ball was inflated! This massive, flexible, ooze-like ball brought great, nah, unparalleled delight to my daughter. She jumped around. She squealed. She was full of the joy and sheer exuberance the likes I’ve never seen. She and her brother bounced and played with the Wubble Bubble Ball. It was declared the best toy ever. I had to touch it. I did. It felt amazing, like the softest, most wonderful plastic money could buy from sweatshops in China. Laughter and lightness filled the house. Less than 5 minutes later, Lily came storming into the house in tears. The Wubble Bubble Ball had popped. Goddamn you, Wubble Bubble Ball. You are a vicious, cruel, dream killer. About 10 minutes later, unsurprisingly, I had been named the culprit in this situation. All fault for this great sadness and despair had been, of course, put on me. 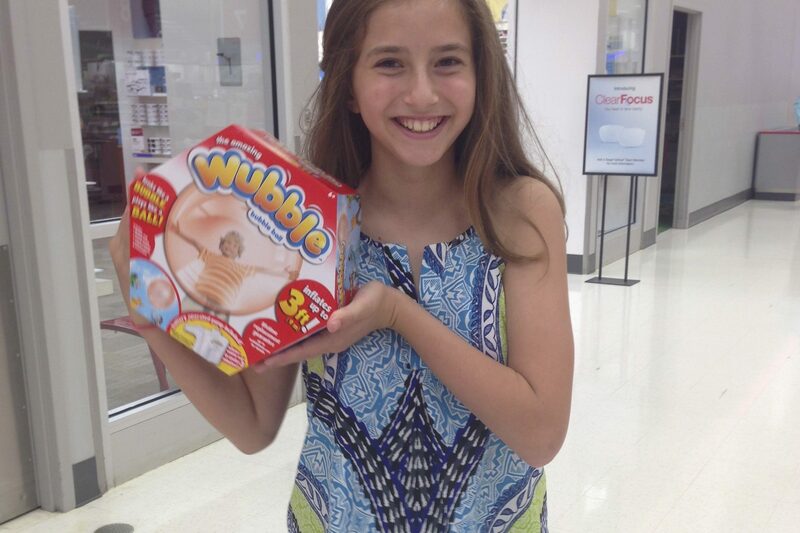 In case anyone is keeping score…the Wubble Bubble Ball is not to be blamed for her deep and endless disappointment. I am. Yes, the person whose only part in the the Wubble Bubble Ball Greek tragedy was buying it twice in one day, is to blame for all the pain brought upon her. Screw you, kid. And screw you, Wubble Bubble Ball. I’ve had about enough from both of you. But, today is a new day. The sad, deflated, very scary, red plastic shell of a ball sits on our kitchen counter mocking us with its power to determine the mood of our entire family. For as much as I hate the Wubble Bubble Ball, I refuse to be beaten by it. Yes, we will make our way to Target, demanding a second refund, buying another Wubble Bubble Ball and inflating it, once again, with all the foolish hope that it will be different this time because like all addicts, we want the high so much, we are willing to risk the low. As you make your way into this wicked world of Wubble Bubble Ball dread, I want to leave you with one last thought…Do not taunt the Wubble Bubble Ball. I wish that I had seen this and the comments before buying the mini one for my 9 year old son. It made it 3 days before getting a hole. Then he wanted to find the hole, but in the process of reinflating the thing, put another hole in it with the inflating straw. We will not be replacing it. I’d rather use that money to buy a bag of balloons that last much longer. Mail back two months ago. No ball no money. I returned it right back to Target! Worst toy ever! Bought one for my 9 year old granddaughter took about 5 minutes to pop. It said to mail it back to wubble bubble plus 6.99$ two months ago. I’m afraid I’ll never get another or my money. The Wubble Bubble Ball fiasco described by you had me laughing so hard at the end I could not breathe right!! I needed a good laugh! Thanks. I think we need a blog entry on the deep seated mother-daughter dynamic that caused her to blame you for Wubble Bubble disaster 2. That’s comedy gold! Jess – you must buy it! The joy outweighed the tears. Plus – after reading Meredith’s blog don’t you want to experience this all for yourself? Maybe you should buy one for each of your kids! Mer you are hysterical. My kids saw this as in tv too and I actually had it in my “ideas for Xmas list”. I thought it was only on line but now i know I can join you at target for some home grown misery!